A recent episode of the Big Bang Theory got me thinking about the impact of childhood experiences in Science and Technology. The main characters, Leonard and Sheldon are brilliant physicists, the kind of “beautiful minds” that understand how the universe works. In this particular episode they meet Professor Proton. They grew up watching Professor Proton’s science shows on TV and reminisce how the Professor has been an inspiration for them and several others like them who are innovating, discovering new frontiers of science, engineering and technology. Childhood exposure to STEM can have a lasting impact. I have always believed in exposing children to STEM fields early … Belief and popular anecdotes aside. Research suggests the same. So, timing of exposure is important. Also important is how those experiences are delivered. 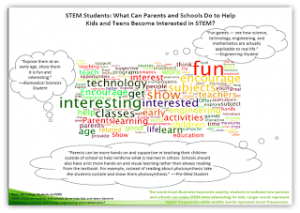 In a survey conducted by Harris Interactive, STEM college majors were asked what can parents and schools do to help kids and teens become interested in STEM? 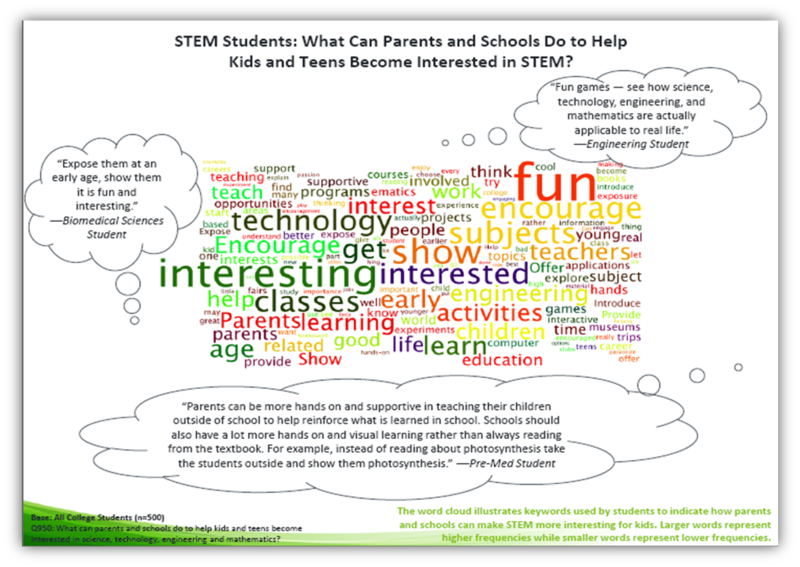 As you can see in the word cloud, their clear message is make STEM fun and interesting. Image Source: STEM Perceptions: Student & Parent Study by Harris Interactive Commissioned by Microsoft Corp.
Thankfully, today, some children have the option to engage with and experience the fun side ofscience and technology at an early age. When selecting the right program, always remember that STEM without the 21st century skills is like putting colors in air (no canvas)! For the colors of STEM to take effect, you need the canvas of 21st century skills of Communications, Collaboration and Critical Thinking. What has been your experience with early exposure to STEM for your child? Leave a comment and share with us. Follow the discussion further and share your thoughts on Facebook and Twitter.